If you teach middle school math or Algebra 1 and you are not reading Fawn’s blog, then you should. I get all of my ideas and inspiration from her! 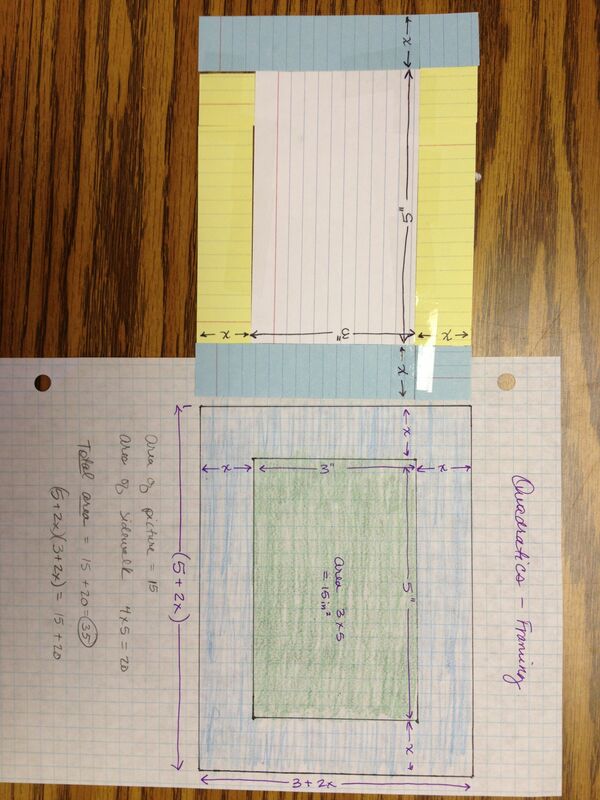 She posted a great activity about Quadratics and framing. Please go read her post for instructions. 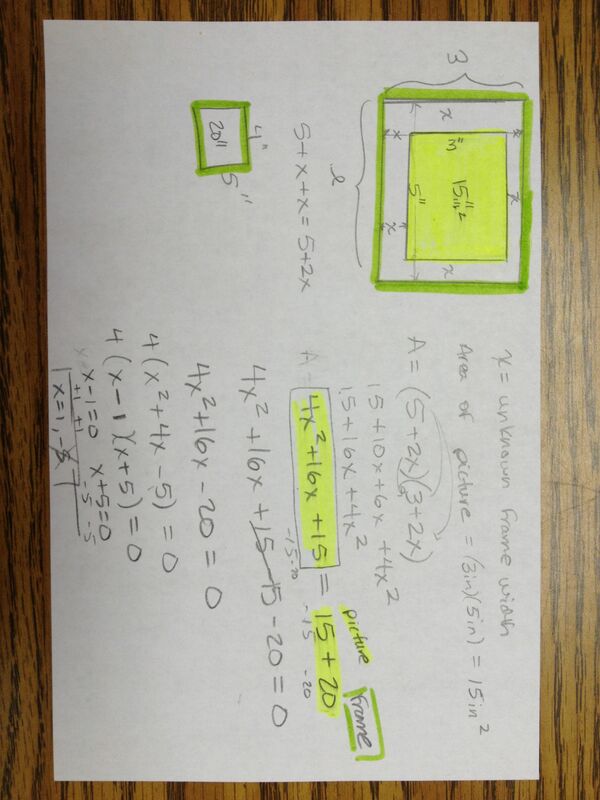 I wanted to post how I modified her activity for Pre-Algebra (using simple factoring instead of the quadratic formula). I followed her instructions exactly, and modified four things. I teach Pre-Algebra so I made the problem easier for my students so that the numbers would be easily factorable and not need the quadratic formula. 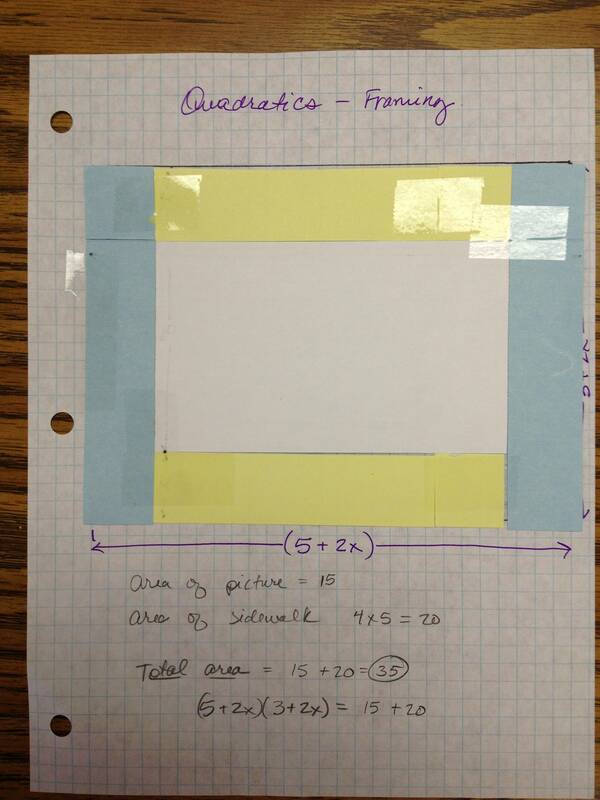 As a result, my students were more easily able to discover the frame dimensions (sadly, they did not beg). It did take most of them quite a while however and they appreciated when I finally showed them the math. I used index cards so I wouldn’t have to cut up a bunch of paper to the perfect size. Really Fawn, you are a saint. I had my students draw the picture on 3×5 index cards, then I used 4×6 index cards for the frame. I cut them down to 4×5 to make the border an even 1″ (see #1). I had them post the finish product on a half sheet of paper. This way they could glue down the picture and the frame instead of using tape. I am always short on tape. Also, on the back of the picture is where we all “did the math”. I am posting mainly to say THANK YOU for Fawn, and to share my students creations! I am really into notebooks so I also included an idea for adding the work to the students notebook. On the back of their picture, we did the math. Totally stealing this as well as Fawn’s ideas as soon as our state testing is over (or maybe before).